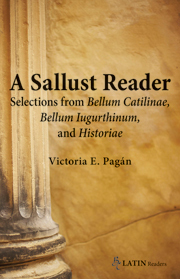 This reader aims to introduce advanced Latin students to the works of Sallust, unique among Roman historians for several reasons. Because he uses standard vocabulary and uncomplicated syntax, Sallust is an accessible author at this level. Unlike other Roman historians whose subject matter was a distant past, Sallust writes about events that occurred in his lifetime. His roller-coaster career afforded him a unique opportunity to critique the inner mechanisms of contemporary Roman politics from the vantage of an outsider. Complete with introduction, text, commentary, vocabulary, and bibliography, this volume contains selections (556 lines) from the Bellum Catilinae, the Bellum Iugurthinum, and the Historiae. Selections include character sketches, conspiracy and its betrayal, ethnography, a political speech, and a description of a lavish banquet. Students are prepared for an eventual reading of the monographs in their entirety and become acquainted with the fragmentary Historiae. This reader teaches the rudiments of Latin prose by reinforcing transferable skills that can be applied to other prose authors. While attention is given to Sallust's distinctive style, emphasis is placed on general structures so that students achieve comprehension and appreciation of Latin prose as a distinct—and majestic—art form in its own right.